Waikiki is without a doubt the most famous location in Hawaii. Once a playground for Hawaii’s royalty, today Waikiki is best known for its beaches, resorts and hotels, many of which are located either on or within a short walking distance to the beach making it the gathering place for visitors from around the world. On the main strip of Kalakaua Avenue, there is world-class shopping, dining, entertainment and activities that can be found at the Royal Hawaiian Center and Waikiki Beach Walk. For novice surfers, the calm waters of Waikiki make it the perfect spot for lessons. For families, Waikiki also is the home of the Honolulu Zoo, the Waikiki Aquarium and penguins at the Hilton Hawaiian Village. For additional community information, or to view properties for sale, visit ColdwellBankerHomes.com. Click here for your local Coldwell Banker office. Honeymooners can enjoy romantic sunsets viewed directly from the beach, hotel rooms or many of the top-rated restaurants Waikiki has to offer. The fun does not stop when the sun goes down. Live music from many of Hawaii’s top local musicians and dancing combine for an amazing nightlife. 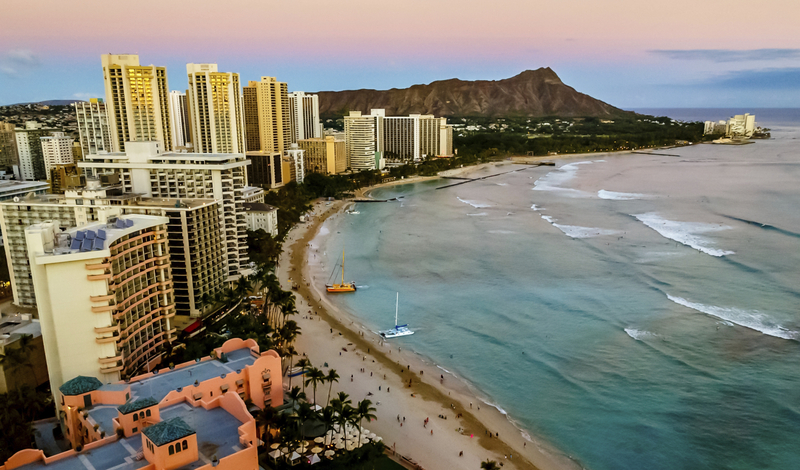 An added bonus is that Waikiki is centrally located just a short drive to Oahu’s largest shopping mall, Ala Moana Center, the Hawaii Convention Center and Chinatown. With so much to offer, once you’ve visited the famous shores of Waikiki, you’ll want to live here.